Hi ho, all, it’s Alice again. As if it’d be anyone else, right? 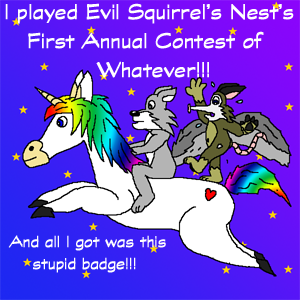 Oh, wait, I guess it could be Sad Pony, Squirrel, Mary Alice, or my latest bud-dy, Sparky the Won-der Blog-ger! 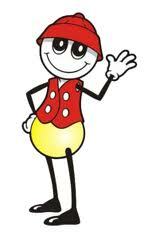 I have been told he resembles another Sparky who led children in Bible verses in a religious club known as Awana. There was even a theme song. “We are sparks, sparks, sparks, sparks to light the world!” Sparky has quite a back story he isn’t telling me. Awana leaders, please do not come after me! Anyway, another blogger, Laura (Linking to fellow bloggers to say thanks is not Sparky-ish), suggested that Sparky should have a name for his followers. I think that’s a fabulous idea that has probably never been done before! Her suggested name is fabulous too. She said followers should be called “Sparkleponies.” Who hasn’t wanted to be a Sparkle Pony? I, personally, had eleventy-billion of those sparkly My Little Ponies when I was a kid. Of course I wanted to be one. Only Barbie herself had more bling. But like any club, there has to be badges so peeps know who has had the most Kool-Aid . . .I mean, who is a true and loyal follower of Sparky. So I made one for Sparky, all by myself, once again putting my education and multiple art classes to work. Check it out. 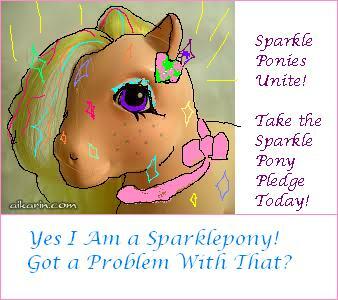 Now if you want to join the Sparkleponies, all you gotta do is take the pledge. Oh and a few other things. You can find them in the fine print of your enrollment forms, but I wouldn’t worry about them. It’s just minor details, really. A trifle, really . . . Okay, then, now you are ready to say the pledge! “Yes I am a Sparklepony! Got a problem with it?” Say it loud and proud. Then go put your badge on your blog, like on the side, or better right in the border of your blog. You’ll be glad you did. There are many benefits to joining Cult Club Sparklepony. Here’s a handy list. You get to worship Sparky at the blog of your choice, this one, Aliceatwonderland. You get to explain to people how you have never grown up and no you do not intend to now. You’ll get paid . . . in joyness and inner peace. It’s just cool, you guyz. Okay, then, my only question left to you is – are you a sparklepony? * Edit – It was actually Laura who came up with sparkleponies. My bad. Alice no can read. I gotta add this to my blog, I must! Because I am a Sparklepony! Yay! Welcome to the cul . . . club! Sparklepony, sparklepony, sparklepony . . . don’t say it in front of a mirror. But it’s a rainbow sparkly tail, that’s what’s important. I would definitely be a Sparklepony if it wouldn’t make Rainbow Donkey jealous…. Rainbow Donkey could be Sparkle Rainbow Donkey. He could, but I sense that he’s not feeling the Sparky love. He could just be jealous that he can’t wear that nifty Devo hat Sparky’s rocking due to the whole issue with the horn…. You’ll have to drill a hole for him. So he can whip it. Whip it good. I’ve always wanted to be a Sparklepony. I will put it on my blog with pride! My destiny has been fulfilled. Yay! Mine too! 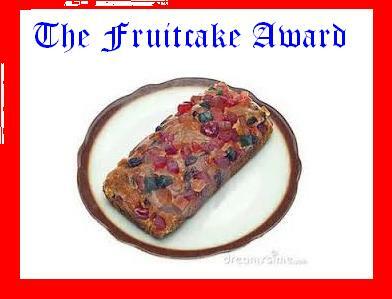 Oh, I still have to put it on my blog, next to the fruitcake! I’m thinking of a contest in which someone wins a My Little Pony . . . what can I do? Hmm. I don’t know, but I put Sparklepony up and she looks dazzling! Nope. Cannot do it. Nope, nope, nope. 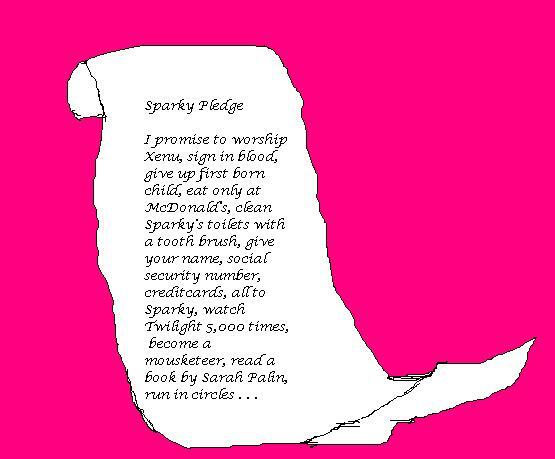 I will not read a Sarah Palin book so, alas, I cannot be a Sparklepony. I is all sadfaced about this, but I must adhere to some sense of morality. I think we can make an exception and lay off the Palin book. That was pretty extreme. I’m all jazz hands with excitement! Jazz hands, Jazz hands! Everybody sparkle! <—– I suffer from Cranio-Rectal Inversion. Can someone shove a Sparklepony up here please, so I can see it? Right away sir, sparklepony coming up. You have to explain it to the ER though. The other things I can do, but watch Twilight? No way. I draw the line on that one, k? Sure, we can make exceptions for you, Sad Pony and Squirrel insist! Welcome Sparklepony! Can I brush Sparky’s hair? I watched Twilight. Yes! You can be my Secretary of SparklePonyLand, WT. I trip over my own feet! I watched Twilight once and I’m not watching it again. Can I chop off my left leg instead? Yay! I’ll fetch the saw. Sparkleponies here I come! True story: I made my kid read an Ann Coulter book when he was suspended from school. He had to write a report on it too. He requested next time to just be grounded and fed bread and water. In the beginning there were sparks, sparks, sparks, sparks, sparks to light the world! Oh yeah, I would have preferred bread and water too. I bet you can hear her screeching while you read. Uh-oh. I should have made this clear earlier — I didn’t invent the word Sparkleponies. I just thought it would be appropriate here. I first saw the word in the title of this book, which I haven’t read but plan to someday. I hope this doesn’t set of a chain of events and rumors and Internet scandal that will be forever known as Sparklegate. Set off. Not set of. I’m a sparkle pony- you got a problem with it?